Imagine yourself in the upper corner of a room, watching the goings-on with a bird’s-eye view. There are no threats from above you, and you can see all that’s happening below you. You can relax. This is what a cat’s instinct tells them to do. A lion or tiger sleeping away the afternoon in the branch of a tree can rest there and will awaken quickly if there is any disturbance from below. To work with this cat instinct, provide your cat with acceptable perching places. It could be as simple as a chair with a pillow or towel on the seat or something as elaborate as a cat tree, available at pet stores or fashioned at home out of posts and platforms. Window sill “observation decks” can also be purchased. These allow Kitty to take cat naps while monitoring the bird feeder. 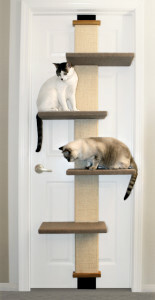 Pioneer Pet® has a large variety of climbing perches that also serve as a place to nap and scratch. Take a look at what they have to offer by visiting “Climbing and Scratching™”. Using a little bit of imagination, you can create a cat-friendly environment of viewing and resting stations which will communicate to your cat that you understand them and that their part of the family!